Super high-res images of the Moon from Thierry Legault and Damian Peach. 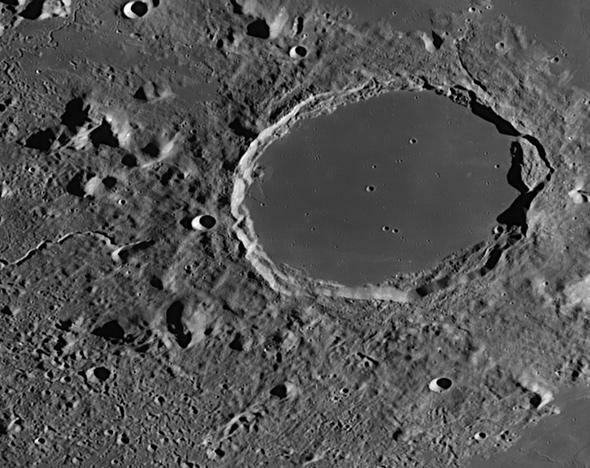 The lunar crater Gassendi, cracked and broken. One really fine consequence of writing about astronomy is having astonishingly talented photographers send me images of the heavens. This burdens me with glorious purpose: Sharing these stunning views with you, and perhaps sneaking in an explanation or two. While so many of these views display gas clouds, star clusters, galaxies, and more, sometimes you need go no further than our nearest celestial neighbor to find treasure. Our Moon has been bombarded by asteroids and comets for eons, having its surface shaped and reshaped. Even a small telescope reveals this, and when you have someone who truly knows and cares how to process the images to bring out the details, what you get is simply wondrous. 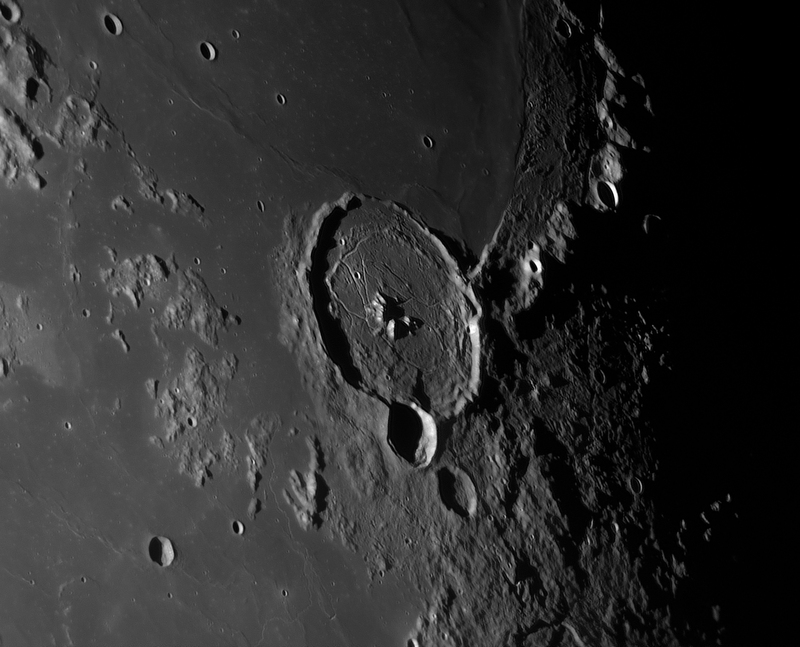 The image above shows Gassendi, a huge 110 kilometer–wide impact crater, just visible in binoculars when the Moon is waning gibbous or near third quarter. This image was taken by master planetary astrophotographer Damian Peach, and is part of a set of high-resolution photos he took of the Moon in 2016. Gassendi is interesting. Its floor is riddled with fractures, called rimae (singular: rima). It’s not known for sure what caused them, but a likely scenario is that the crater floor was filled with lava after the heat of the impact that formed it, and as this lava pool cooled it formed a crust. The crater bowl cooled and settled a bit and the lava crust above cracked, forming the rimae. 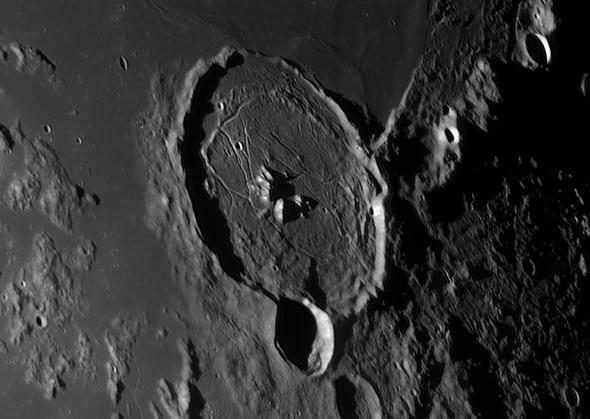 Gassendi is also the site of one of my favorite images from the Lunar Reconnaissance Orbiter, which shows a huge house-size rock that’s tumbled down a slope. Features like that thrill me, showing us a Moon that isn’t static and simple but instead has had a dynamic past that creates features both huge and subtle. I strongly urge you to look at Peach’s collection of lunar images; make sure you have a glass of water handy to rehydrate your mouth after your jaw has hung open for a few minutes. Another of my favorite photographers, Thierry Legault, has produced staggeringly high-resolution images of the Moon at a few different phases, including crescent and first quarter. The first quarter Moon … seriously miniaturized to fit here. Click to enlunenate. I shrank the image to fit the blog here, but you really want to go look at the bigger versions. The full-size version of the one here is 51 Mb in size, and is 10,000 x 15,000 pixels! The maps are mosaics he made using a 35 cm telescope from the Alps in August. You really want to click through and see some of the frames he took that make up these images, because holy wow. Plato crater, a huge impact scar on the Moon. When it formed (or perhaps due to subsequent impacts or vulcanism), Plato’s floor filled with lava and created a smooth surface … at least until you look very closely, and find it filled with many smaller craterlets. Given its size—more than 100 km, nearly as big as Gassendi—it’s obvious in binoculars, with the dark basaltic rock of its floor and lack of large internal cratering giving it a striking appearance. I have been observing the Moon my whole life, from the time I used a junky department store refractor, moving up to a 25 cm reflector, and even working on some Hubble images of it (that, sadly, did not pan out). Ironically sometimes the Moon irritates astronomers; it’s very bright, and when it gets near full it washes out the sky, making observing anything else difficult. But even then, it’s an object of great beauty. 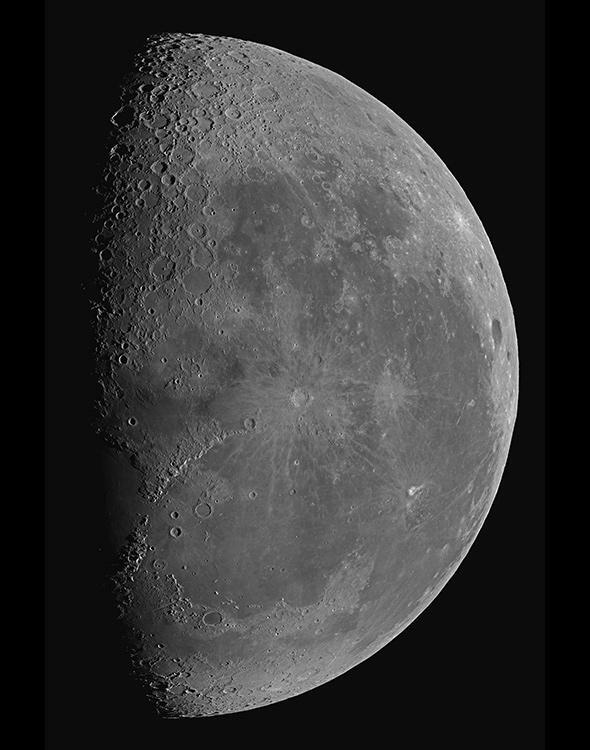 I try to maintain perspective when the Moon is near full; observing it with binoculars or using my own ‘scope, I look for the rays of Tycho, highlighted by the steep sunlight angle, or peer near the day/night line (called the terminator) to see the sharp edges of shadows cast by crater rims and mountains, foreshortened by perspective. There is never a wrong time to cast your gaze toward the Moon, and despite its ancient and nearly unchanging physical face, it never seems to look the same way twice.